Cream the butter and sugar together by hand or in a food mixer (no need to over cream). Add the eggs and beat for several minutes. Reduce speed and mix in the flour. Turn out onto a piece of floured greaseproof paper, flatten into a round, wrap and chill. This pastry needs to be chilled for at least 2 hours otherwise it is difficult to handle. Roll out the pastry thinly and use about 2/3 of it to line a suitable tin. 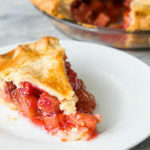 Slice the rhubarb into small bite-sized pieces. 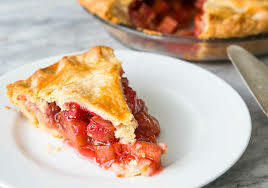 Fill the tart with the rhubarb, sprinkle with sugar. Cover with a lid of pastry, seal edges, decorate with pastry leaves, egg wash and bake in the preheated oven 45 minutes to 1 hour. When cooked cut into squares, sprinkle lightly with castor sugar and serve with softly whipped cream and Barbados sugar.